A multi strand tribal necklace with 5 strands of shell heishi and rondelle beads. 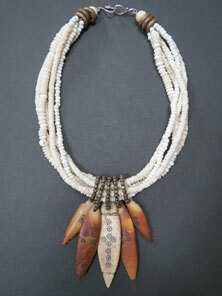 Five Ethiopian bone spear pendants are attached with small Nepalese brass beads and dangle loosely from the shell beads. Large African brass trade beads finish the necklace with a sterling silver clasp.